"After the first race, nobody saw me as a title contender and after the second everyone sees me as one," Leclerc said. "I need to work as hard as possible, try to do the best job in and out of the car. I am pretty sure the results will come - and then we will see." 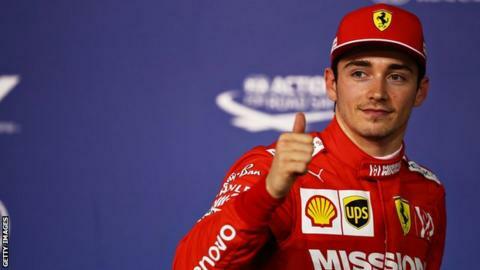 Leclerc tops nominal Ferrari team leader Sebastian Vettel by four points after the first two races. The Monegasque is 18 points behind leader Valtteri Bottas of Mercedes, who leads team-mate Lewis Hamilton by a point. Leclerc dominated the Bahrain Grand Prix, despite losing the lead off the line after taking pole position, but was slowed in the closing stages by a short-circuit in his engine, handing a one-two to Hamilton and Bottas. He said: "It was a positive weekend. The win was very close. Hopefully I will get my first win soon. That was the target and it is what I am working for." Leclerc ignored a team order to stay behind Vettel for two laps when he caught him early in the race in Bahrain, but he said this had not changed things within the team. "From the beginning we both want to beat each other and that's normal in any team," Leclerc said. "We have found a very good compromise by competing with each other on the track and working together when out of the car which is extremely important for the team and the development of the car." It was the second time in the two races so far this season that Ferrari had told Leclerc to hold station behind Vettel. He was also ordered not to pass when he caught Vettel quickly in the closing stages of the season-opening race in Australia. "As I showed in Australia, the interest of the team is extremely important," Leclerc said. "But in this particular situation I had quite a big pace advantage at this moment and I had the opportunity on the straight - I just didn't see myself lifting and staying behind. I went for the opportunity, it was a safe pass and I went for it." He insisted he would be allowed to fight Vettel for the win in China this Sunday if the situation arose. "Of course," he said. "This is clear and it was clear in Bahrain." Vettel said he had not been happy with the balance of the Ferrari so far this season. "I wasn't happy with my performance [in Bahrain]," he said. "Not happy with the feeling yet with the car, the feeling that I had prior to the season in testing. And Vettel said he had no problem with Leclerc's actions in Bahrain. "I'm not surprised," Vettel said. "It is quite clear that he was quite a lot faster at that point. "I could have passed him back on the next straight but I judged it that it's going to lose me more time and him more time. It didn't go my way on that Sunday so at that point it wasn't about holding Charles' Sunday back." Vettel said Ferrari had "understood" the problem that cost Leclerc victory in Bahrain, which the team said was caused by "a short circuit within an injection system control unit", as well as why they were off the pace in Melbourne. "We learned our lessons from Australia and should be in a better place here," Vettel said. Ferrari start the weekend in China as favourites after dominating Mercedes on pace in Bahrain, where Lewis Hamilton inherited victory and his team-mate Valtteri Bottas completed a one-two after Leclerc hit trouble. Ferrari's advantage in Bahrain was largely caused by the car's prodigious straight-line speed. Hamilton said Ferrari's engine performance was "impressive to see". "It just means that we are challenging other areas to try to pull more from the car. But my confidence and our focus and our attention has not wavered - I'm still very confident that we can extract more on weekends," he added. "It's not just about straight-line speed, it's about cornering performance, reliability, the mechanical side of things, the process you go through the weekend, driver, due diligence. It's making sure you have all those things ticked off." Bottas said: "It's a track with very long straights and straight-line power, and speed is really important here. We know Ferrari are going to be strong and hopefully we have our strengths in other places. "We obviously know we have work to do and it was an unusual step in terms of pace for Ferrari from the first to second race. We definitely know the areas we can improve and there are further upgrades to the car here. Hopefully that can make us stronger."